Success and the Christian is a compilation of A.W. Tozer sermons on the subject matter of spiritual maturity-both its cost and criteria for the believer. The overall purpose of this collection is to "promote the personal heart religion"' among God's people, something Tozer consistently emphasized. Knowing God deeply and intimately brings purpose and meaning to life and should be the Christian's highest goal. So what holds us back from authentic spiritual success? A.W. Tozer contends that it is the excess baggage that most Christians carry that prevents them from going further with God. In this insightful and prophetic book, Tozer shows how we can recognize and clear away the stumbling blocks that keep us from a dynamic relationship with our Savior. 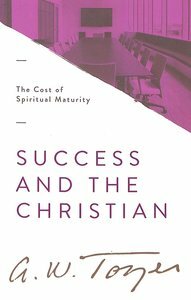 About "Success and the Christian: The Cost of Spiritual Maturity"
A. W. Tozer died in 1963, but his life and spiritual legacy continue to draw many into a deeper knowledge of God. During his lifetime, Tozer pastored several Christian and Missionary Alliance churches. Missions and the deeper life in Christ were his primary focus. He also served as editor of the Alliance Life. Tozer authored more than 40 books, (at least two of which are considered classics: The Pursuit of God and Knowledge of the Holy), a tremendous accomplishment for a man who never received a formal theological education. The presence of God was his classroom, his notebooks and tools consisted of prayer, God's Word, and the writings of early Christians and theologians, the Puritans, and great men of faith. - Publisher.